I'm playing around with colors because the kids like the colors. My personal experience and that of people who sell at craft shows tells me this. 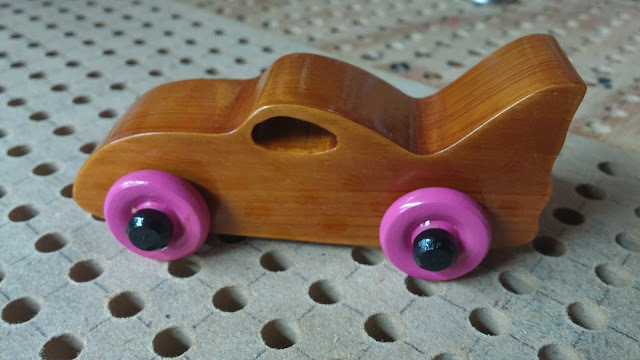 Adults tend to go for the wood grain and the kids go for the bright colors. I have this bright pink paint I'm experimenting with so I decided to see what it would look like as wheels. Black was the only axle pin color I had that worked with the pink. The body is pine with several coats of amber shellac. The Wheels are painted with pink acrylic and top coated with clear shellac. The hubs are black acrylic with clear shellac on top.